The global frozen meat market depicts the presence of a highly fragmented and competitive vendor landscape, says Transparency Market Research on the basis of a recently published report. Such a vigorous competitive spirit is majorly present due to innumerable players operating in this sector. Most of the businesses have good connections with service companies and food chains, thus maintaining a consistent and dedicated demand of the product. Companies are adopting aggressive marketing strategies to enhance their brand name; following which participating in mergers and acquisitions has led towards improvement in their network. Verde Farms, Marfrig Group., BRF S.A., Kerry Group Plc., Pilgrim’s Pride Corporation, Tyson Foods, Inc., LLC, Associated British Foods Plc., and Arcadian Organic & Natural Meat Co., are key players operating in the global frozen meat market. Many players are tying up with cold storage services to sustain their position in the market. Key businesses operating in the global frozen meat market are investing substantial amount of money to enhance production techniques by carrying out extensive research and innovation. Lastly, owing to such innovative production methods introduced, several players are aiming towards increasing product yield, production capacity, and regulating product costs. 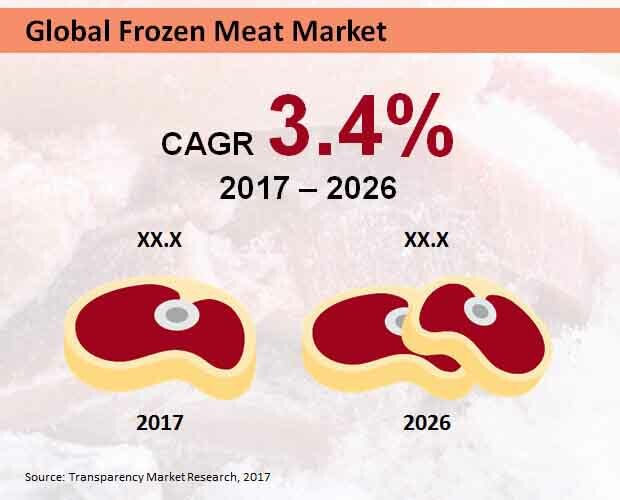 According to experts from Transparency Market Research, the global frozen meat market is expected to fetch revenue worth US$30.0 bn by the end of 2026. This growth is projected to occur at a steady CAGR of 3.4% during the forecast period from 2017 to 2026. Widespread advancements associated with freezing techniques to lengthen the lifespan of meat products and improve their quality are primarily driving growth in the global frozen meat market. Eating habits are rapidly changing all over the globe, and many now prefer ready-to-eat meat products and foods. A fast-paced living standard, surge in online food orders, and availability of less time to cook using freshly bought meet, are three lifestyle changes, which are making the global frozen foods market grow extensively. With food delivery services becoming more efficiency and cheaper, the frozen meat market is expected to witness an augmented growth in the near future. Sometimes, restaurants and foodservice chains might face a shortage of fresh meat, and this could hamper their sales greatly. However, this situation can be reversed by storing frozen meat and utilizing as per requirement. Thus, as utilizing frozen meat proves extremely beneficial for restaurants and other food joints, the global frozen meat market is expected to witness a handsome growth. However, processing frozen meat often proves to be costly, which can further translate into expensive foods for the end user. Such costs could notably discourage potential customers, making them consider other options. In this way, high expenditures required for processing of frozen meat is greatly hampering the global frozen meat market. Moreover, shortage of frozen meat in less developed regions too is posing as an obstacle to the market’ growth, from a geographical perspective. Nevertheless, many businesses are introducing cost-effective processing techniques, which could offset most restraints affecting the global frozen meat market. Companies are adopting aggressive marketing strategies to enhance their brand name; following which participating in mergers and acquisitions has led towards improvement in their network. With food delivery services becoming more efficiency and cheaper, the frozen meat market is expected to witness an augmented growth in the near future.